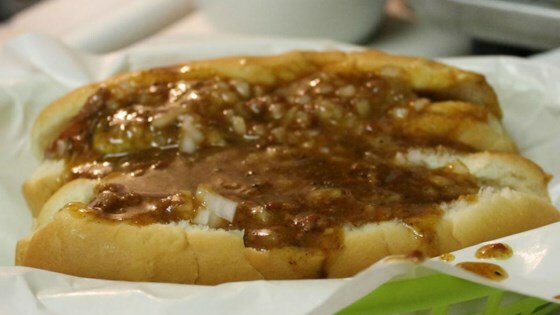 "While living in the Mid-Hudson Valley of NY I fell in love with this style of hot dog, particularly the sauce. My wife was born there and she loved them as well. When we moved to Texas it was a surprise to find, 'There is no such thing as hot wiener sauce in Texas.' I did a lot of research and found the recipe is a closely guarded secret that I had to crack. After years of experimenting I finally created the same experience we only had back in NY. Serve on your favorite hot dog with brown mustard, diced onion, in a steamed hot dog bun. This sauce will be thin, it is supposed to be, it is not a 'chili dog' recipe. The sauce will thicken as it cools. It freezes well." Stir water, ground hot dogs, vinegar, paprika, chili powder, sea salt, red pepper flakes, onion powder, oregano, cinnamon, white pepper, thyme, and black pepper together in a large stockpot; bring to a boil, reduce heat to medium-low, and simmer for 45 minutes. Stir cornstarch with just enough cold water to dissolve completely; stream into the hot dog mixture while stirring. Continue to cook, stirring frequently, until the sauce has thickened slightly, about 15 minutes more. Adjust salt and pepper to taste before serving. I grew up in Buffalo NY and have been trying to find a recipe for Texas Hots sauce. This is near exact.